Two veteran anti-litter campaigners in Dover, Adeline Reidy and Peter Sherred, are applauding recent and continuing work undertaken by so many individuals, organisations and local communities to counter the increasing trend to drop litter and to deposit large items of rubbish and they are urging people not to waver in their clear up activities because the litter droppers do not give up. They also have warm words for Dover District Council and Highways England with their agents Veolia in the exercise to clear the verges of the A2 and A20 earlier this year. The A20 was cleaned over 8 days from the Aycliffe Roundabout on the outskirts of Dover up to the Roundhill Tunnel, Folkestone, where an average of 6 men working on the road cleared 12 tonnes of litter, detritus and fly tipping! 4,980 kg of waste was cleared over 10 days duration with an average of 5 workers per day clearing the A2 as far as the Lydden lights. 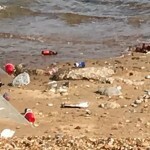 The work of young carers, associated with the smART Project, is singled out for particular praise in their efforts to gather up rubbish from the beach where, sadly, people are adding to the problem of plastic and rubbish collections in the sea. 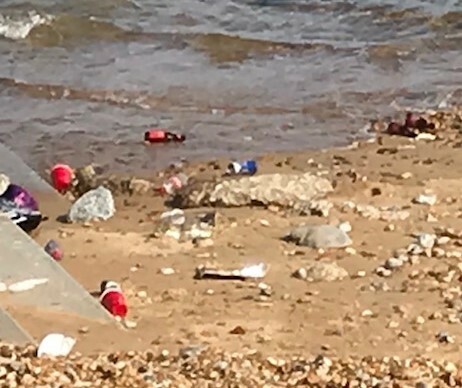 Without in any way detracting from the efforts of so many civic minded people, who voluntarily clear rubbish, they are highlighting their own recent experiences and of a couple of other long term litter pickers trying to maintain some form of dignity for the town. Long-term litter-picker, Ken Read (83), who for many years has patrolled Dover streets, spends time picking up litter in Harold St, Taswell St, and the area surrounding Dover Castle coach park, areas he regularly clears, often resulting in two full bags of rubbish being collected which, he said, is “indicative of the blatant disregard people are still showing about keeping their own environment clean”. He is sometimes told “that’s not your job”! and is of the view that social responsibility seems almost moribund now but adds “I do live in hope that more people will take up the cudgel”. 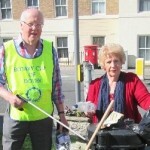 Adeline Reidy, who earlier this year was made an Honorary Freeman of the Town, has focussed on keeping the area around Castle Street and Castle Hill Road clear of rubbish having reported to Dover District Council accumulated rubbish on the corner of Dolphin Passage going into the new St James’s Shopping Centre. A settee had to be removed from Russell Street and waste disposal operatives had to remove considerable rubbish from a parking area on Castle Hill Road caused by a flat change in the area. She has applauded the many flags and flowers that decorate the streets and enhance the area. 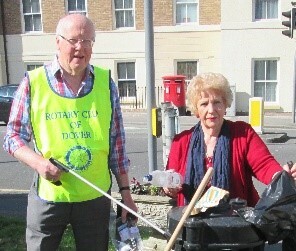 Peter Sherred (70), a Past President of the Rotary Club of Dover in which he has been engaged in many litter pick events, has been active clearing rubbish from the roads leading into Guston and around the coach park for Dover Castle as well as Old Charlton Road. He was once asked by a member of the public “Why do you bother doing this – don’t you realise you are facing a losing battle?” Having spent considerable time one evening clearing Hangman’s Lane, Guston, and exposing a large pile of builders’ bags and other items in the process, all of which were reported to Dover District Council, within less than 24 hours he was driving down the Lane only to find 17 large and full mauve or black bags deposited at intervals along the verge he had just cleared. “This was not simply litter dropping but rubbish dumping on an industrial scale” he said, adding that the Council workforce was quick to respond to a report of these items and cleared everything away speedily. But why, ask Adeline and Peter, should they have to and why should the public have to pay for the clearance of these matters created by people deliberately and without any concern for the quality of our local environment? Honoured by Dover Rotary Club earlier this year with a top Rotary award for his community service John Morgan (71) was active in the first months of 2018 clearing three cemeteries and areas in and around Old Charlton Road. In the early autumn of last year he assisted the Rotary Club in clearing litter from St Mary’s Primary School playing field and surrounds when, among other items, an amazing 24 vodka bottles were collected as well as sacks of other items dropped or thrown by thoughtless people in close proximity to where primary school children play. 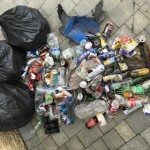 “The trouble is” says Mrs Reidy “we seem to live in a culture where it is deemed acceptable to throw our rubbish away on the basis that ‘they will clear it up’ – whoever ‘they’ are”. She has focussed her attention on the appearance of Castle Hill Road having requested Dover District Council to have the pavements swept thoroughly on both sides of the road. Bag it or bin it. Do not drop it. Best of all – take it home! This entry was posted on Thursday, August 30th, 2018 at 1:22 pm	and is filed under all posts. You can follow any comments to this entry through the RSS 2.0 feed. You can leave a comment, or trackback from your own site. 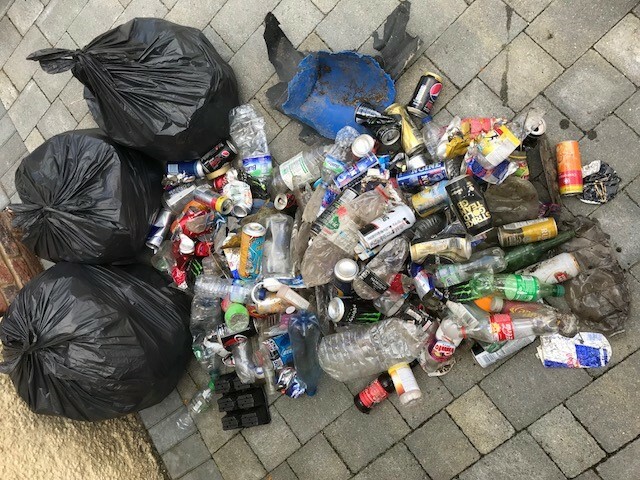 Well done Adeline Reidy and Peter Sherred, i understand why Mr Sherred keeps on going, I also pick up litter around my area, same results – 2 full bags without fail..a few days kater you can guarantee 2 full bags of new litter will return. Its a sad state of affairs and it is a losing batte for the 1% of us who will actually go out of their way and give up their spare time to try and clean up after the lazy bone idle folk. Well done. I totally understand and I too become downhearted yet… what else can you do but start the revolution…the culture will change… Love where you live!